The Alpine Institute at LAS is delighted to introduce our joint project with Swissôtel Hotels & Resorts. Sponsorship from Swissôtel supports conferences, visiting scholars, equipment needs, and grants to LAS students on scholarships. It also enables us to develop an exciting joint project to explore and document the urban ecology and biodiversity around Swissôtels in nearly 30 cities worldwide. We’re calling it “Nature Nearby”. At the moment we’re developing pilot projects at our locations in Zurich, Chicago, and Singapore. We intend to expand to other hotels worldwide. To find out when Nature Nearby will come to the hotel where you’re staying, please contact us here. 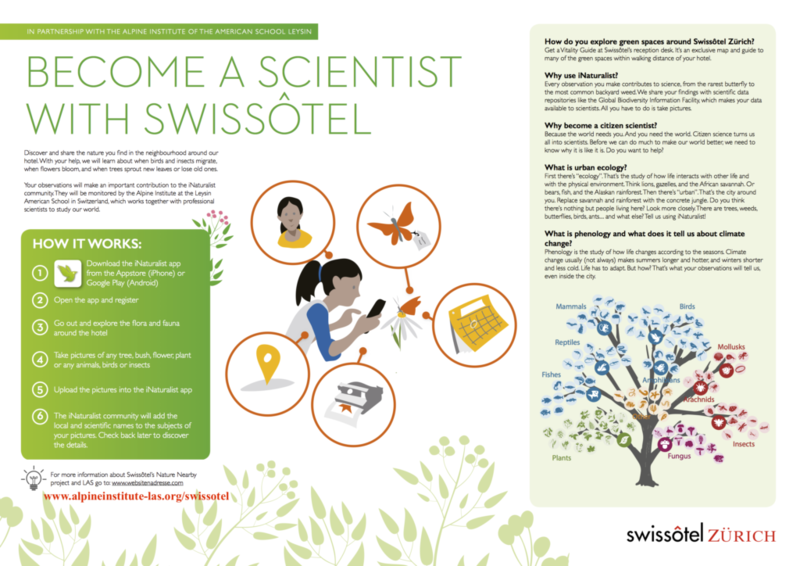 Become a Citizen Scientist with Swissotel (draft 2). How do you explore green spaces around Swissôtel? Get a Vitality Guide at Swissôtel’s reception desk. It’s an exclusive map and guide to many of the green spaces within walking distance of your hotel. Every observation you make contributes to science, from the rarest butterfly to the most common backyard weed. We share your findings with scientific data repositories like the Global Biodiversity Information Facility, which makes your data available to scientists. All you have to do is take pictures. Because the world needs you. And you need the world. Citizen science turns us all into scientists. Before we can do much to make our world better, we need to know why it is like it is. Do you want to help? First there’s “ecology”. That’s the study of how life interacts with other life and with the physical environment. Think lions, gazelles, and the African savannah. Or bears, fish, and the Alaskan rainforest. Then there’s “urban”. That’s the city around you. Replace savannah and rainforest with the concrete jungle. Do you think there’s nothing but people living here? Look more closely. There are trees, weeds, butterflies, birds, ants … and what else? Tell us on iNaturalist! What is phenology and what does it tell us about climate change? Phenology is the study of how life changes according to the seasons. Climate change usually (not always) makes summers longer and hotter, winters shorter and less cold. Life has to adapt. But how? That’s what your observations will tell us, even inside the city.